Daytona or Bust. Don't bet against bust. I left Los Angeles with a change of clothes, my cellphone and a trunk full of kitty litter. 328,000 miles on the clock for the Million-Mile Miata and one goal for me: Get it to the next idiot, he's going to drive it at Daytona. It&apos;s Daytona or bust for the Million-Mile Miata. Don&apos;t bet against bust. 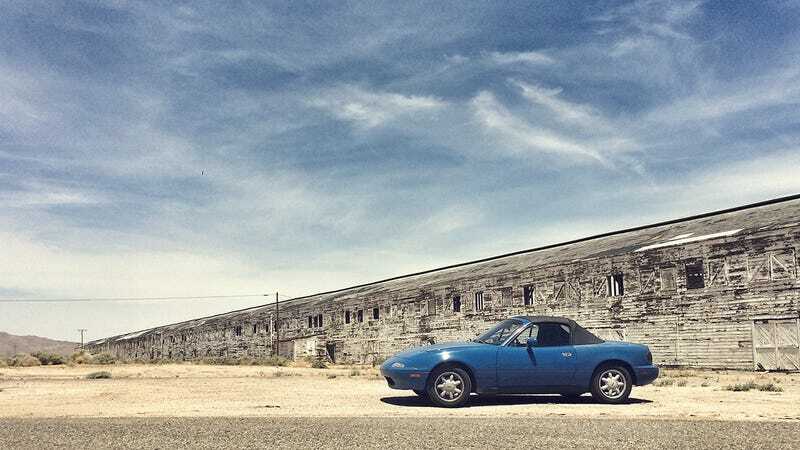 Day one of our cross-country journey took us from the Miata's long-time home in Los Angeles across a summer-scorched desert, past the 1/4 mile long dream of peeling white painted hangars of the Barstow/Dagget county airport, through the Arizona border. We planned to meet terrycloth-robed editor Bowman in his luxurious accommodations, somewhere in Sedona, Arizona. But Sedona was a 500 mile drive and a whole lot of desert for a car with no service history and the equivalent of 13 trips around the world under its belt. This is that story, part one of five or so from our trip East. And just one of many more to come.